GE reflux wears many faces. You might see a baby who spits up all the time…an adult with heartburn…a child who won’t gain weight…an unhappy toddler…a chronic cough…wheezing…recurrent pneumonia…an infant who cries and cries…any one of these may be the only symptom of gastroesophageal reflux. Between the esophagus and the stomach is a portal called the lower esophageal sphincter (LES). Normally, when someone swallows, the food travels down the esophagus, the sphincter relaxes, and food is permitted to enter the stomach – where a pool of acid awaits to continue digesting the food. The sphincter then closes tight. When the sphincter does not remain tightly closed, the acid and the food slosh back up into the esophagus. This is what is meant by reflux. These reflux stomach contents can burn the lining of the esophagus and irritate the lungs. A small amount of reflux immediately following meals is common in healthy adults and causes no problems. Swallowing saliva to wash away the acid protects the vulnerable walls of the esophagus. In most newborns, the lower esophageal sphincter is relatively lax. Thus, frequent spitting up is common in infants. This is called physiologic reflux. These are normal, happy babies who eat well, gain weight, and who have no other symptoms. Still, this spitting up is often upsetting to parents. Physiologic reflux can also be quite inconvenient in that parents frequently must change clothes — theirs and the child’s. One of my sons was a big spitter-upper. Over time, the lower esophageal sphincter becomes more competent; children eat more solid food; they assume a more upright posture. The spitting up diminishes. Symptoms might include poor weight gain, heartburn, irritability (especially after eating or while lying down), bad breath, excessive cavities, wheezing, chronic cough, pain with eating, or recurrent pneumonias. A child might have any or all of these symptoms, but not actually spit up, if the stomach contents are re-swallowed. How long does gastroesophageal reflux last? In most cases, the spitting up resolves without treatment by about 18 months of age. If reflux persists beyond age 2, there is generally not much improvement until at least age 4. Over the next few years a number of children outgrow the condition, but the closer they get to puberty with reflux, the more likely they are to have reflux as adults — unless corrected. When reflux lasts beyond about 18 months, or when it is associated with other symptoms at any age, it should be evaluated. The evaluation might include pH probes, gastric emptying studies, or X-rays (such as an upper GI series). Medical treatment for pathologic reflux is usually quite effective. It might include changing feeding and posture habits. Some medications can help speed the emptying of stomach contents into the intestine. There are medications that work to reduce stomach acid. If pathologic reflux persists despite prolonged medical therapy, a surgical procedure called a Nissen fundoplication is sometimes performed. This uses folds of the stomach to tighten the lower esophageal sphincter and it is quite effective. 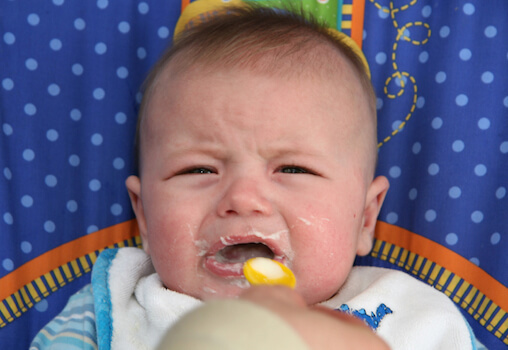 Sometimes smaller, more frequent feedings will prevent reflux.